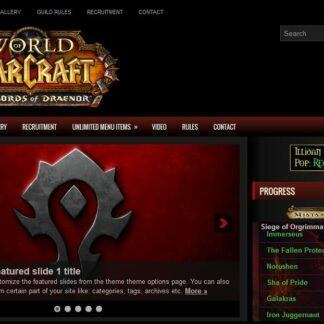 Are you seeking the perfect template for your world of warcraft guild website? 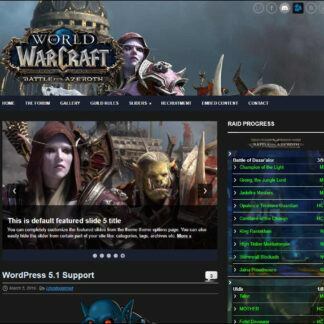 Or maybe you run a personal blog and would like a WoW style to fit your personal site. 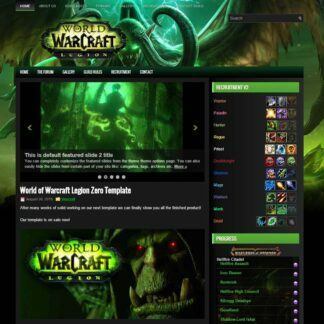 In either case both professional gaming or personal blog this template is ideal for the wow enthusiast in you. The graphical layout is stellar demanding your viewers attention the minute they visit your site running our new Blackrock Foundry theme they will instantly know you are a serious guild since your running your own site with a unique modifiable theme, the eye candy will keep all of your members happy while the easy to use administration of wordpress will let people from the most advanced webmaster to the orc peon be able to operate wordpress. 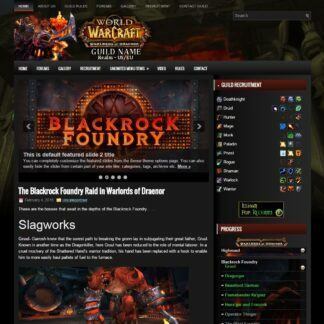 Our newest template named Blackrock Foundry as a dedication to the world of warcraft raid, thetheme by default comes loaded with skins and items in relation to the new raid, these can all be changed by you the theme owner or webmaster at anytime. Our templates come with a sub or mini admin panel from inside of your wordpress you can enable and disable theme options, add all new image sliders or change how the system makes sliders by letting it pick from tags and such, as we said it works for advanced users and basic users its quite adaptable and is usable on any modern wordpress website. There is also a theme plugin know as the recruitment module that is included in the Blackrock Foundry world of warcraft website theme, you will be able to specify what classes and spec you are currently working on recruiting in just a few clicks by making classes open or closed which will then reflect on your main page instantly upon saving your changes. The amazing modular platform that WordPress lets us work with also allows us to offer you other addons also included like a basic what you see is what you get widget maker to help you create widgets faster then ever, we also include a basic lightbox that will help your sites image pop in the theater like effect! 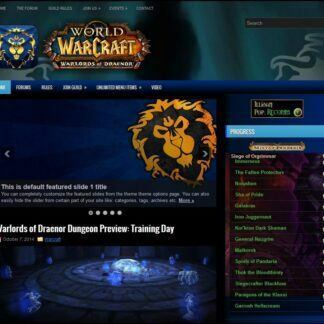 There are still lots of items included such as a blizzard blue or GM post tracker which works for both North American wow servers and European World of Warcraft servers, the widgets can pull data, date and time, link and you can set how many are displayed if any at all, the site comes with customization in mind when you use a template from Ejeet Networks for your warcraft website. Do you kill bosses or raid? Of course you do even if its just a few right now you did it and you are proud you did it, show it off to the world wide web by simply clicking the bosses you have killed, you can also set normal, heroic or mythic or even all three or just two its totally custom to you and your guild tracking progression in world of warcraft for your guild site was never easier then this its a simple point click, save and reap the rewards of the world knowing your guild killed the raid bosses you decided to list. 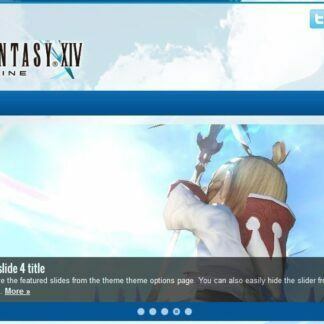 What do you need to use this template or any of our templates? You only need a working valid WordPress 4.5+ installation to use our themes or styles on your guild website. If you have any questions at all please visit our live chat or use the contact us button in the top menu the friendly staff at Ejeet Networks will be more than happy to assist you in any way we can.